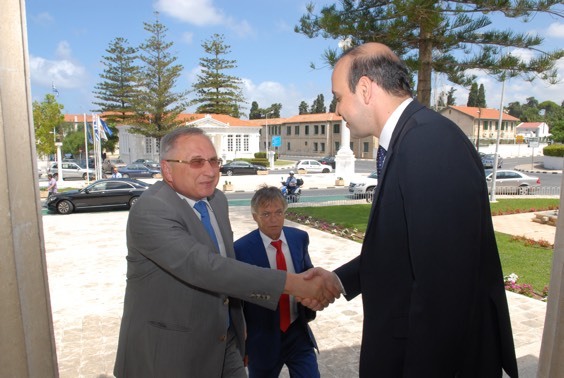 The meeting of the Ambassador of Russia and the Mayor of Paphos: prospects for cooperation. 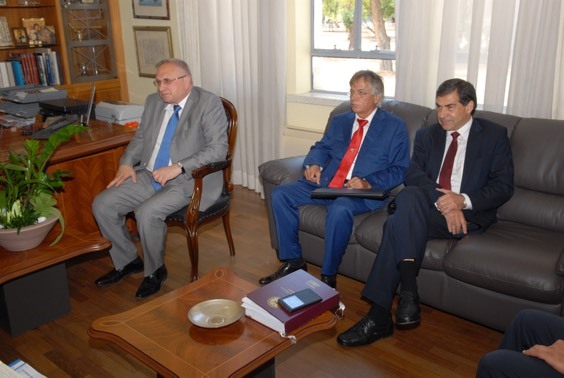 During the visit of the Russian Ambassador in Nicosia Stanislav Osadchy to the Administration of Paphos and the meeting with Fedonas Fedonos, the Mayor of Paphos, was stated the development of close and fruitful cooperation between the Embassy of the Russian Federation in Cyprus and the Administration of Paphos. The ways to enhance cooperation for further improvement of Russian-Cypriot relations and, in particular, the development of relations between the town of Paphos and one of the Russian cities were discussed in detail at the meeting. Summarizing the results of the meeting Mr. Osadchiy expressed great interest in the multi-faceted cooperation with Paphos and emphasized that for this purpose there are already concrete plans, in particular, in the framework of the program “European Capital of Culture – Paphos 2017”. “We look forward to close cooperation. We have a lot of work to be performed at a high level,” – he stated. The Mayor of Paphos Fedonas Fedonos enounced satisfaction with the meeting and highlighted that in the near future the Administration will consider the ideas that have been discussed in order to develop a comprehensive, mutual cooperation between the two parties in the field of culture, tourism, business and the European Union in general. Mr. Fedonos noted that “especially now, when the city of Paphos is preparing for the big event “European Capital of Culture 2017”, this collaboration is becoming even more important, because we are united with Russia by close cultural ties and long-term friendship”. Moreover, the Mayor added that in the framework of this project the cooperation of Paphos with major cultural organizations and institutions of the friendly country was discussed. Responding to a question on the possibility of Russian investments in Paphos, Mr. Fedonos said that “discussion is not about the money, it is about development of strong fundamental relationship with Russia”, adding that “in this context, in the case of revenue, investments are welcome”. He pointed out that representatives of other local authorities, who took part in the meeting with the Ambassador, also expressed interest and willingness of the Administration to the multidimensional cooperation of Paphos with the Russian Federation. The meeting was attended by the Honorary Consul of the Russian Federation in Paphos – Georgios Prodromou, the Counselor and Chairman of the Committee on Foreign Relations of Mayor’s Office – Lazaros Omirou, the Chairman of the Paphos’ Chamber of Commerce – Andreas Dimitriadis, the Chairman of the Paphos’ Bar Association – Epaminondas Korakidis and the Secretary of the Paphos’ Administration – Themis Filippidis.